The Dress Reform Movement was started by Amelia Bloomer (yes, bloomer) in the US, and was closely related to the first feminist movements. In response to the immobility that 18th Century fashion imposed on women, Ms. Bloomer created a costume that included the upper layers of traditional dress, shortened over Turkish-style pants, tied at the ankle cuffs. This costume did not show more of the body than traditional dresses of the period, but it was still found unacceptable because trousers were only for men. In addition to “radicals”, social reformers and feminists, doctors and hygienists also supported the Dress Reform Movement. They stressed the medical dangers of corsets, and claimed that women should wear no more than 3 kilos of undergarments as opposed to the more standard 7 kilos containing the crinoline, corset and other accouterments. The expansion of industry and the improvement of living conditions saw the advancement of leisure activities. 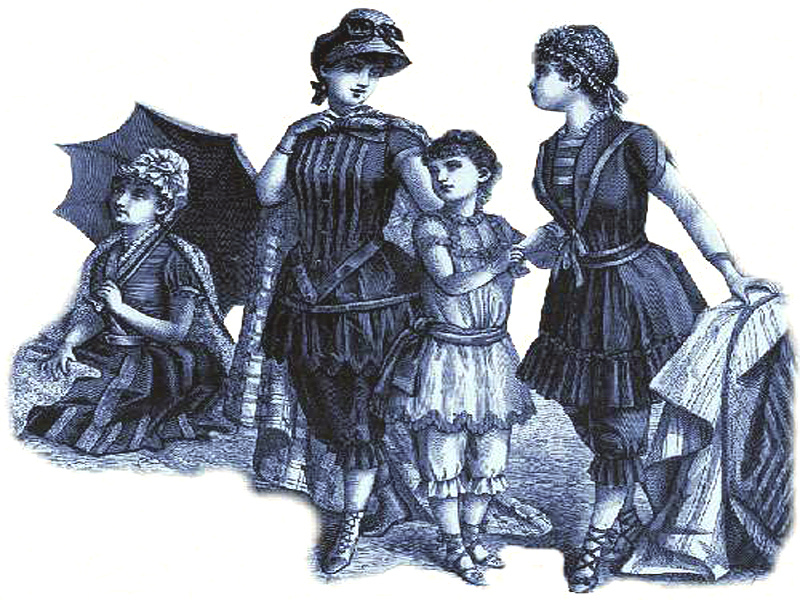 Sports became increasingly fashionable among upper-class women, who in turn needed specific kinds of clothing for these activities. From the last years of the 19th Century through the first decades of the 20th Century, cycling, swimming, golf and riding were especially popular.